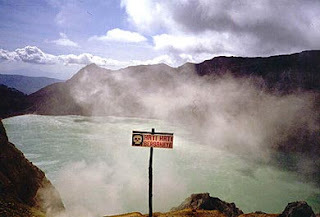 Ijen plateau is highly recommended to mountain buffs and hikers. The Plateau was at one time a huge active crater, 134 sq km in area. Today, Ijen is a quiet but active volcano, and the landscape is dominated by the volcanic cones of Ijen (2,368 asl) and Merapi (2,800 asl) on the northeastern edge of the Plateau, and Raung (3,332 asl) on the southwest corner.